Territory Planning - A Catalyst Sale Approach? 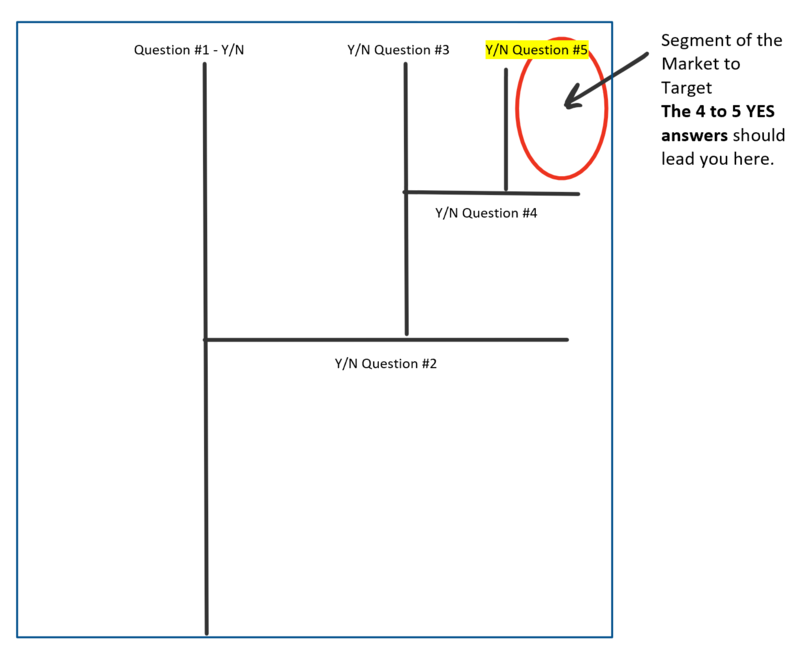 Now draw a vertical line down the center of the whiteboard - ask a Yes/No question that helps you distinguish between those who are in your market, and all others. Your targets should fall to the right. (An illustration follows) Draw a perpendicular line to the first line, just to the right of your first line. Then ask a second Y/N question that helps to further distinguish your target market. Your targets should now fall above the second line. You are further segmenting your target market, and creating focus. Repeat this process with a minimum of 4 questions. This will help keep you and your team focused. Question #1 - Organization has a sales team (Y/N)? Question #2 - Sales team has grown in the past year, and based on organization growth, looks like they will continue to do so (Y/N)? Question #3 - Organization continues to roll out new product capabilities to the market (Y/N)? Question #4 - Organization has a “Sales Enablement” function (Y/N)? Question #5 - Organization is located within my territory (Y/N)? Now you have identified your ideal customer. The next step is to determine how many of these customers you should focus your attention on. Again, the first response might be “everyone of them” - why would I limit my success by only going after a handful? This gets back to some of the discussions we have had around time management and to paraphrase a quote from Gary Keller & Jay Papasan in "The One Thing,” if you prioritize everything, you prioritize nothing. You’ll notice - we worked the math out to target ~10 companies per month in the first quarter of the year. This is intentional, it allows focus on 3 companies per week in the first month. John Boyd introduced us to the OODA loop - Observe, Orient, Decide, Act - REPEAT. Today, we talk about Agile in the context of software development. Historically, we have discussed agile in the context of sales. Your territory plan is a living breathing document, just like the account plan. Take time to adjust and adapt your plan based on the things you learn, as you engage with your customers. Is the sales cycle shifting to a 9 to 12 month sales cycle? Increase the number of customers you engage with. Are deal sizes larger than expected, but more complex than anticipated? Back off your number of targets, and focus on those who are further along in the sales process. Thank you for rating and reviewing the podcast via iTunes, Google Play, or your favorite podcast platform. Ratings & reviews help others discover the podcast - thank you for helping us get the message out to the sales, account management, startup, sales enablement and customer experience community. Whether you are an early stage company trying to validate product market fit, or a more mature company looking to break through the next plateau. We are here to work with you.